Construction of the UNC Hospitals Surgical Tower will begin Oct. 22. The project will require the closure and demolition of the pedestrian bridge connecting the Cardinal Parking Deck with Tarrson Hall and West Drive. Pedestrians and motorists should follow designated reroutes and remain alert to construction vehicles entering and exiting work zones at access gates. The new seven-story Surgical Tower will offer modernized operating rooms, improved rooms for recovering patients, and more space for families and guests. The 330,000 square foot facility will include 24 operating rooms, family waiting rooms on each floor, 56 pre/postoperative care areas, and 56 intensive care unit beds. When completed in 2022, the Surgical Tower will be the largest building on the UNC Medical Center campus. For construction questions or concerns, contact Stephanie Berrier, communications manager for Facilities Services, at stephanie_berrier@unc.edu. For questions concerning transportation and parking, contact UNC Transportation and Parking during regular business hours at 919-962-3951. 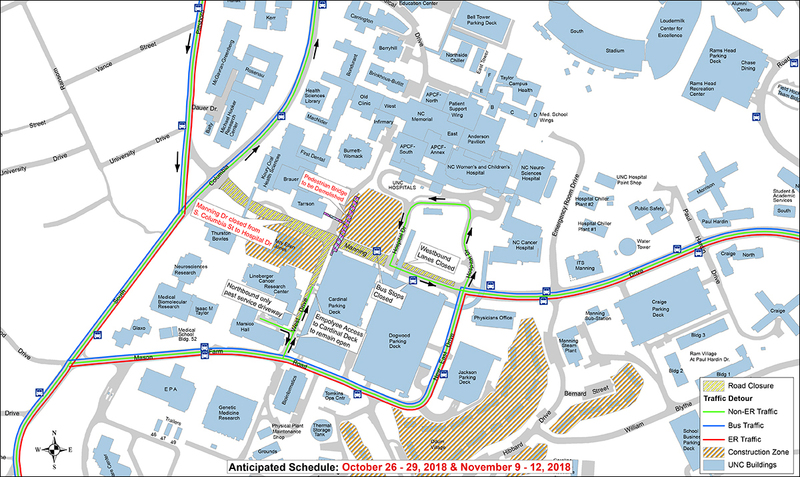 To facilitate the removal of the Cardinal Deck pedestrian bridge, Manning Drive will be closed to through traffic the weekends of Oct. 26-29 and Nov. 9-12. 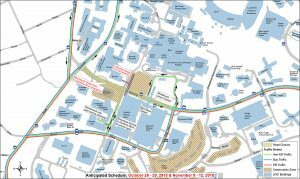 During the weekends of Oct. 26 and Nov. 9, Manning Drive will be closed between South Columbia Street and New East Drive from 8 p.m. Friday through 5 a.m. Monday. Traffic will be detoured along Mason Farm Road and New East Drive. 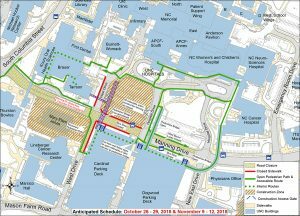 The Dogwood Parking Deck will remain open and accessible for patient and visitor parking. 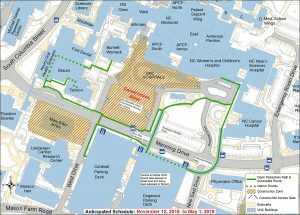 Staff should access the Cardinal Parking Deck from Mason Farm Road; vehicles will enter the deck at the southern end of West Drive, going the wrong way on what is normally a one-way street. 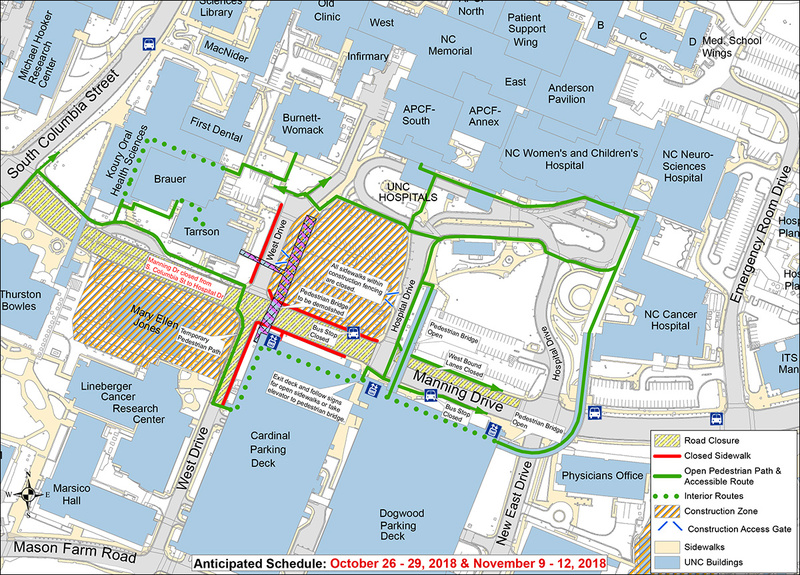 Pedestrians should remain alert to traffic changes and follow designated pedestrian detours. Bus stops #3238 and #3239 on Manning Drive at UNC Hospitals will not be serviced while Manning Drive is closed. Chapel Hill Transit and GoTriangle will make every attempt to maintain schedules, but riders should plan for possible delays due to rerouting. Chapel Hill Transit will implement detours on the D, FCX, G, HU, NS, NU, RU, Saturday V, Weekend NU and Weekend U routes. Visit Chapel Hill Transit for information on alternate stops and route detours. GoTriangle routes 400 and 800 will also be rerouted; refer to GoTriangle for more information.